i am a TRAVELER and EXPLORER | traveling from one experience to another and blogging about it. traveling from one experience to another and blogging about it. I am not an authority on this. So you may want to consult another expert. But as far as I understand it, you pull up to the sign. Do this pulling up on an off time, not during the normal times for breakfast, lunch, or dinner. It will all be less stressful this way. After pulling up to the sign, get ready to make your choice because the drive-thru worker will usually give you about a minute to decide. If you are like most of us travelers, you will have trouble deciding between the millions of different options and choices available. So, you will probably have to say, just a minute. In fact come to think of it, maybe I should have suggested that you go inside of the restaurant first and decide what your “usual” will be. It is just so stressful if you have no idea what to order, are puzzling through an unfamiliar menu, and have people behind you in line getting irritated. Maybe you have finally decided. Mmmm a pineapple malt, some onion rings, a grilled chicken sandwich. The drive-thru worker’s voice comes over the microphone in the sign, asking if they can take your order. Do not freeze up, confidently lean out your window, and yell slightly loudly. Then repeat it if need be. They will then ask that you pull up to the window. I know that you have probably eaten at a restaurant before, but this one actually caused me a lot of stress, so I will address it here in case you need the help. When my family left Papua New Guinea we went to a mall in Australia. It was a pretty overwhelming experience, so many choices, so many people, and weirdly enough, I was disoriented by the fact that I was no longer a minority and no one stared at me. My family all split up for lunch so we could eat what we wanted at the food court. I chose a sit down Rock and Roll hamburger joint type place. It should have been very comfortable to me. But, I found myself starting to panic. I did not have a clue how to order, if I should seat myself, how to pay, and so on. The whole time I figured that everyone was probably staring at me and thinking what a weirdo I was for not being able to handle this little slice of America. They weren’t of course, but it was scary enough that I decided to leave and go to the Chinese restaurant; at least there the food was more familiar. In Papua New Guinea there are a lot of Asian expatriates and therefore a lot of really delicious Asian restaurants. My whole family must have had the same thought because we all ended up sheepishly back at the same restaurant, comfortably ordering the more familiar. It’s Saturday afternoon and my husband and I just returned from the discount grocery store. The store was packed. What is it about noon on Saturday that brings out the crazies? I always thought that around ten on a weeknight would be crazy time. Oh well, we were able to steer around the giant carts full of Doritos and find ourselves some whole wheat pretzels, date and walnut cereal, and seventy nine cent yoghurt. So how can I help you navigate through the crazy aisles of your local grocery store? How can I teach you to make grocery shopping a pleasant experience. It has almost become a cliché, but it can be very daunting to walk into a grocery store for the first one hundred times after you return to the United States. The aisles and aisles of choices are overwhelming. The smells are new. The vegetables seem foreign (the papayas are oddly colored and so small, and the bananas are boringly bland). The crazy amount of cereal choices makes your head spin. Even though in your former life you were able to navigate confidently through a busy market, the quiet background music and organized rows of a grocery store can throw you for a loop. With the bags of cash that you have been making at your job, and with your newly minted debit card, you are ready to pull up and fill up your new car. I hope that the gas prices will have dropped by the time you are reading this, but right now we constantly get indigestion every time we buy gas. But, I digress. The key to successfully braving the first gas station stop is to pick a gas station that has pay at the pump. They are a little less embarrassing for your first couple of times. It can cover up the fact that you may still be having trouble swiping your card suavely, that you have to follow all of the instructions, and that you are still a little nervous opening the gas tank. Then, pull up very confidently to the pumps. No one will guess that you are a newbie. I probably should have said first of all that you should remember which side your gas tank is on, that way you will know which side of the pump to pull up on. Park close to the pumps, pulled a little forward so that you can get out your door. This takes a little practice, but all you risk is the humiliation of having to stretch the nozzle all the way to your tank, or having to slide out your door because you parked too close. The only time I have bought a car; I followed my first rule and had someone with me. Admittedly it was my husband, and he had only a little bit more experience than I did. But we were rather desperate, and had no one we could take to hold our hands. Our trusty rusty lemon Honda had died at the side of the road, so we quickly borrowed a classmate’s car to travel to the local dealerships and try to find something in two days. There were about three lots close to us. The first one, Bubba’s Barbeque, was a rundown restaurant with several clunkers out front. Bubba came out in his baggy jeans, suspenders, and white wife beater to offer us a great deal on these sweet lil’ minivan. We were actually tempted. It was close to our price range. But we kept on moving. The big beautiful nice car lot had some sweet black Toyota Tacomas, but with no credit and only a little money in the bank, there was no way. Family friendly Auto Barn loomed on our horizon. We walked past all of the tickets, and saw two cars in our range. There was the fun beautiful shiny red Jeep Cherokee and the teal Minivan with gold rims. Of course there is a catch. The Jeep had a lot of miles. We debated and prayed and decided to take the Jeep for a test drive. We drove it out to school and asked some experienced car buyers. They were all men who thought the Jeep was sweet, but they assured us that Jeeps are like anvils. Their engines are solid. So we went back and decided to buy the impractical car. The owner of the Auto Barn gave us an amazing amount off of the price for our lemon trade-in. We looked around for the evil car dealership puppet masters. But we didn’t see any. We squinted at the paperwork trying to find the fine print or the strings. But again, there wasn’t any. So with beating hearts we took up our pens and signed the paperwork. We’ve now had the car for four years. We’ve neglected it and shut our ears to any clanks and rattles, but surprisingly it has held up and done pretty well. It’s old and overused, and we are starting the process over again. So what can we learn from this story? First rule: decide if you want to buy new or used. New can last you a long time and come with perks like dealership warranties and such. But it is rare that you as a traveler/student will be able to afford new, and new begins to depreciate as soon as you drive it off the lot. You can buy a mostly new, used car for less and be quite happy with it. I have never done or even contemplated either of those. I buy the older then old used cars, and pray that they still have some get up and go. Second rule: Consider what type of car you will want; considering your budget, your needs, the fuel efficiency (you probably don’t have enough money to fill it up very often), and so on. Decide if you want to buy through the classifieds section, internet, or from a traditional dealership. I know an MK who successfully bought an Audi SUV off of ebay (or at least that is what I heard from someone, who heard from someone else). Now isn’t that a classic example of our nomadic, technologically minded generation? If you buy through the internet or the classified you will likely get a better deal, but something might seriously be wrong with the car. It is always good to follow the following rules. Third rule: take someone with you. It is amazing, but all of the behind-the-scenes, expose things they do on car dealerships, seem to show that dealers will give older, adult males a better deal. If your adult male has experience they will see things that you won’t. Fourth rule: Do your homework. When you have narrowed your choice down, take the car for a test drive. See if you can take it to your mechanic and have them check it out. They’ll find all of the things that the dealership has tried to cover over with wax and Armor All. Look at Kelley Blue Book (www.kbb.com) to find out what price similar cars are selling for. Pay for a www.carfax.com report to see how many owners the car has had, what accidents it has been in, and so on. When you are ready to sign the papers, www.howstuffworks.com says to have “your financing and loan approvals” already figured out. I have no experience with loans, we have always bought things with cash, so you will have to ask someone else about that. Or perhaps someone with experience can write something up for me? How stuff works also says that when you are going through your paperwork, keep an eye out for those strings I told you about up above. The form is “As Is” statement. Many used car dealers will mix that in with the other paperwork you’ll be asked to sign. As with anything that requires a signature, READ BEFORE YOU SIGN. You should have at least 30 days to make sure the car is in good condition. If you sign an “As Is” statement, once you drive the vehicle off the lot, anything that goes wrong is your problem.” Once your paperwork is signed and notarized, grab the keys and go. If you want further advice, go to the How Stuff Works website and search for buying a car. They have great tips on financing, and such other stuff. ATM’s are a ‘traveler’s” friend. I feel bad saying that though; they aren’t human, and you can’t form meaningful relationships with them. And they don’t give lollipops—a big drawback in my estimation. But they sure help when you are feeling overwhelmed and in need of a machine that won’t look at you funny when you make a mistake. Your bank’s ATM can do most of the things that a teller can do—you can deposit money, withdraw money, and check your balance. My husband’s first bank account was described as a student account; therefore he had to always use the ATM and was penalized if he talked to a real person. Needless to say he got quite chummy with the ATM, and taught me to do the same. First off, if someone is using the ATM when you pull up, stay in your car, or hang back a little on the sidewalk. People get pretty edgy if you crowd them while they are entering their personal information. When they are done, step up with your debit card in hand. Insert the debit card and follow the directions. They should first tell you to enter your pin. Try to remember your pin or have it on hand (I always forget it and get myself into trouble). Then they will ask what you want to do. Let’s say you have that brand spankin’ new pay check from your new job. Grab an envelope, and put in the pay check. Then tell the ATM that you want to make a deposit. It will have you enter the amount that you are depositing. Then the little slot to insert the envelope will open, and you can put the envelope in. It will then ask if you want a receipt, if you want to do anything else (like withdraw cash), and then it will remind you to take your card. ATM’s at gas stations and other banks will work much the same way, but you will likely be charged fines for using them. When you are finished you can step away from the ATM with some cash, your check deposited, and a smile on your face. The murky ocean called the “job world” can be scary and foreboding. But, do not fear, it is navigable. There are many who have successfully gone before you that can show you the way. Books and guides abound, you can check one out from the library. But, I will offer a short tutorial here in the hopes that it will give you some encouragement. The first step to successfully becoming an employed member of our society is deciding what you want to do. Bus driving. Childcare. CNA in a nursing home. Fast Food. Clerking at a Grocery Store or Department Store. Is clerking the right word? Waitressing or Hostessing. Landscaping. Painting. Being a teller at a Bank. Translating. Data Processing. Or any number of other jobs that don’t require a degree, but allow you to make some money. Get an application from the place, actually from several places. Using your best handwriting, fill them out honestly, but not humbly. That means that you should feel free to tell them about all of your small experiences. For example, you owned a parrot, so that makes you perfect for the zoo keeper job. In fact I was offered a job working with adult second language speakers simply because I had lived in another country. After you send in an application, they may interview you on the spot or call you later to come in for an interview. If they don’t call you back, you may want to call them and ask if they have looked at your application yet. This may show some go-get-it-ness. If they do agree to an interview, get excited and get prepared. Bring all of your information; social security number, driver’s license number, home addresses for the last ten years, date you can start working, position desired, salary desired, how you heard about the job, your education and training, work history, additional skills, and up to four references. It will be difficult, or at least unique, to list all of the places that you have lived for ten years, but they need this for police checks. The “desired salary” always threw me for a loop. I was always tempted to write thirty dollars an hour or some such thing, but knew they would think of me as too expensive. So then I would want to write minimum wage, but then maybe I was accepting too little. Problem solved when I learned that I could write “standard,” “negotiable,” or “competitive.” Education and training should include start and end dates, school names and addresses, any degrees and dates that you earned them, maybe even the grade point average, rank in your class, and so on. Work history should include the names, addresses, and phone numbers of your previous employers, starting and ending dates, and reasons for leaving. This can be troublesome if you have lived overseas and never had a job. But that is a good excuse to segue into additional skills. Additional skills could include the things I mentioned above: zoo keeper skills, language skills, and so on. You can bring in an additional copy of your application, or a resume that covers these. You may or may not need these and the references. Dress nicely. Skirts or dress slacks are not always required, but they are still a good idea. Try to anticipate what level they will expect. If you are applying to be a bank teller, definitely wear a tie, but if you are applying at McDonalds, be presentable. Finally, during the interview be friendly, positive, and honest, but once again not humble. Don’t overestimate your skills, but don’t underestimate your skills. Today I overheard an interview going on in Starbucks over cups of iced coffee. It was an interesting thing to listen in on. The interviewer, wearing kakis and a polo shirt, was describing the job to the interviewee, who was wearing dress pants and a tie (no not just a tie, also a dress shirt, shoes, and so on). It entailed something like driving around and selling something or other, data tracking, and something else. You can tell that I was not listening too closely. One thing we can learn from it is that your interview may take place anywhere, maybe even a coffee shop. The other is that it was entirely relaxed, not the uptight thing that I usually picture. And third, the interviewee dressed up more then the interviewer. From what I could tell this was ideal. After your interview, they may or may not hire you. Do not be disappointed, learn from the experience. They probably didn’t hire you simply because you are a bumbling “traveler” (see dedication) adjusting to the United States, you probably just needed more experience or to tweak your interview persona. Everyone gets rejected sometimes. In fact some successful people got rejected over and over again, but they persevered. Here is where I should include an uplifting story. I do not have one, so go find one for yourself and encourage yourself with it. If you got the job then you will probably need a place to put your growing money stash. A girl can dream, right? An account at a good bank can work well for you. First you will need to choose the right bank. Fortunately, this is not like marriage, you can “split” if you make a bad choice, or find a better bank. The right bank should have the combination of being nationwide, having free checking, no minimum balance, good interest rates, easily accessible ATM’s, an uncomplicated website, and debit cards. Nationwide is important in that it is annoying to always have to switch banks when you move. This is an all important factor to a traveler like you. I have changed banks about five times in six years. In the end I finally went to http://www.bankrate.com and found an international bank that had all of the criteria I wanted, especially a great interest rate. They do not have a location near me, but I have direct deposit and send any other checks in. Free checking is important, but almost an afterthought at most banks now days. No minimum balance can be fudged if you are rich, but in the bare bones days of college, you better not be charged every time you dip below one hundred dollars. ATM’s are nice because if you are like me, you will be scared to go up to a teller and show your ignorance of the whole process. We will go over this in more detail later. A good website is necessary for paying your bills, watching your balance, and jumping on good deals. Debit cards are useful. Call me a stick in the mud, but I suggest that you do not get a credit card until you have waited a couple of years and established good money practices. They are just too tempting. I have way too many friends that got themselves over their heads in their first couple of years out of high school and are now paying for their mistakes. Therefore, your debit card will have to work in lieu of a credit card. You can run it like a credit card and sometimes even get points like on a credit card. It is more vulnerable to theft, though, so using good internet security measures (for example PayPal) are necessary. I will not diverge to talk about PayPal here, but I want to build your anticipation for the chapter on the internet. Once you have finally decided on the right bank, gather your opening deposit (often it must be over 100 dollars), and a photo ID (passport or license). If there is a branch in your area, open your account in person. If there isn’t a local branch, dial the 1-800 number for the bank, or log on to their website, and go through the steps for opening a new account. If you are walking into the bank, get your papers and courage together, and go in. Wait in the teller line and tell her, or him, that you would like to open an account. She will have you wait in the chairs off to the side while she calls another person. They will then call you into an office. In the office the lady (or man) will be very nice so do not worry. She will have you fill out paperwork, make your deposit, set you up with checks and a debit card, etc. She will be really good about helping you if you let her know that it is your first bank account. You will probably want to open a checking account, maybe even a savings account. With all of your graduation gifts and savings from your new job you may want to look into a Certificate of Deposit or a Money Market account. A CD has higher interest rates, but you cannot touch the money for a certain amount of time without fees for early withdrawal. A Money Market generally has higher interest rates then a normal savings account, but has different stipulations. You can look into all of that online at the bank website or the aforementioned www.bankrate.com. From then on you will make deposits by filling out the deposit slip (on the table near the entrance) and giving it to the teller. She will then do everything else, while you grab a sucker and enjoy the whole experience. 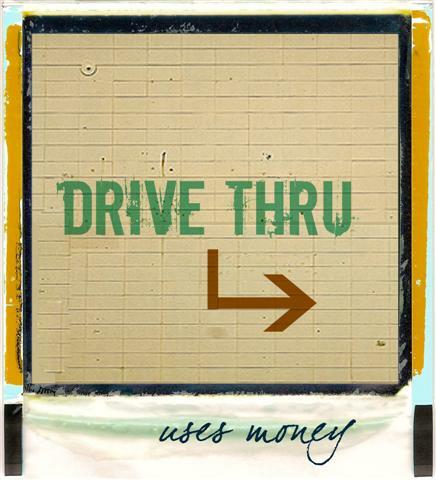 Or, you can deposit your money at the drive-up window, by mail like I mentioned, through direct deposit, or through an ATM. Story: it was years before either my husband or I used the drive-up window because we were so unsure of ourselves and felt so silly. We were unsure of where to get the little vacuum tubes, or how to put our money in (is that with a deposit slip? ), or how to talk to the teller. We would watch someone else do it, but it was hard to get up the nerve to do it ourselves. Finally we just did it and realized that everyone was not watching us or staring at us. They did not think that everything we did was stupid. Honestly, we had coke machines in Papua New Guinea, so I never struggled with this one, but one of my friends asked me to include this. Her cousin returned from the Amazon in Brazil and had a hard time figuring it out. I can imagine the angst that this one would cause. Being eighteen and knowing that everyone around you has probably been using them for years can make you feel very lost and very silly. But, everyone has trouble with them sometimes; their dollars may be crinkled or the machine may be having a bad day. So, when you step off of the airplane, walk confidently up to the machine. It will probably have been awhile since you have had American soda. It should be all the more sweet since you will have to work for it. At the machine look at the price and insert your money. Since it will be at an airport, it will probably be outrageously expensive. Therefore you will likely need a dollar bill. Smooth it out, unbend the corners and insert it face up, the way the picture shows. The machine may spit it back out again. This is either because it is too wrinkly and it cannot read it, or because you have inserted it the wrong way. Or it might be spit out because you inserted your Rupiah instead of your American bills. Right it and try again. Or try change.